As I wrote in my general addition posts, few months ago I found a tiptoi andalusian foal for sale in Alibaba. The purchase was an odyssey because the seller didn't answer my message and spend like 1 month just to send the figurine. When it arrives at home, the poor little guy can't stand up for his own. I think the travel destroyed his legs, because the figurine arrived without any protection. I know this will be a copy but it's a really good one: good material and the animal is the same as the official. 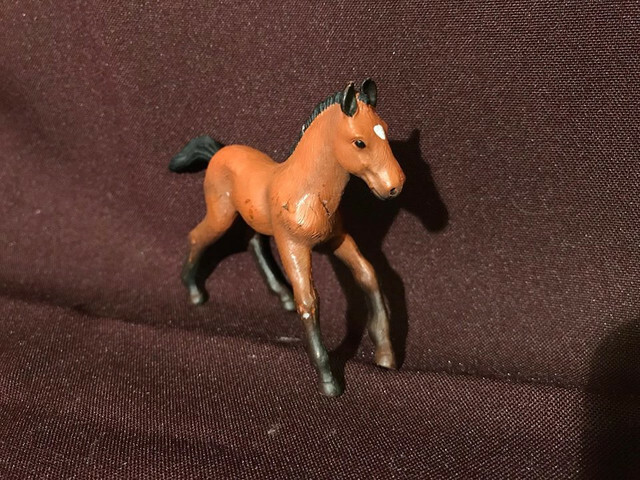 I think this is better than Ravensburger model, because the ugly yellow dot is painted with the same colour has the foal coat. This IS the original figure, only that it did not meet Ravensvurgers standards (because of manufacturing fault, like scratches or bends) so factory should destroy them, but they sell them underpriced for some added profit. Thanks for the info. Now I,m happier with my purchase. Actually I like a lot the delicate legs of that foal. I think it is closer to real than what we usually see due to safety. Unfortunately it hasn't arrived in very good shape but I think it is still a very good acquisition. Thank you all dear friends!! I’m very happy with this boy. For me, the first model of a brand is always special.